"East Africans love a simple, nutritious breakfast that will get them, and keep them, going. That means save for a few pieces of fruit, some (tomato) jam, or some juice, breakfasts are virtually free of added sugar - unlike continental or American breakfasts. 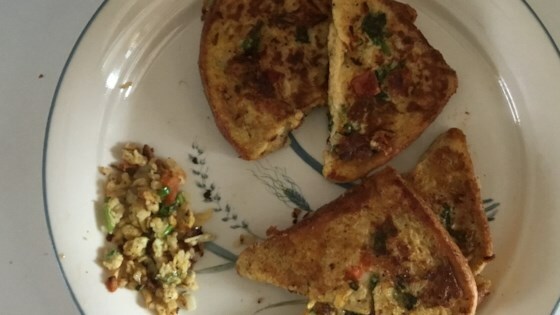 Try this extraordinary savory French toast recipe instead. You'll love it." Whisk eggs and milk together in a large bowl. Season with garlic powder, salt, and pepper. Stir in tomatoes, onion, green chile peppers, and cilantro. Melt butter in a large skillet over medium heat. Dip 4 breads slice briefly in the egg mixture and place in the skillet. Ladle some of the egg mixture over each slice using a spoon. Cook until browned, 3 to 5 minutes. Flip and press down with a spatula; cook until second side is browned, 2 to 3 minutes more. Repeat with remaining slices. Two breakfast favorites—together at last! Use serrano, jalapeno, and Thai chile peppers. Seed if you can't handle the heat. I really liked this and I like the fact that I could pick it up and eat it with my hands. I used 2 slices of bread and half a Serrano. Will make again. Thanks for the recipe!